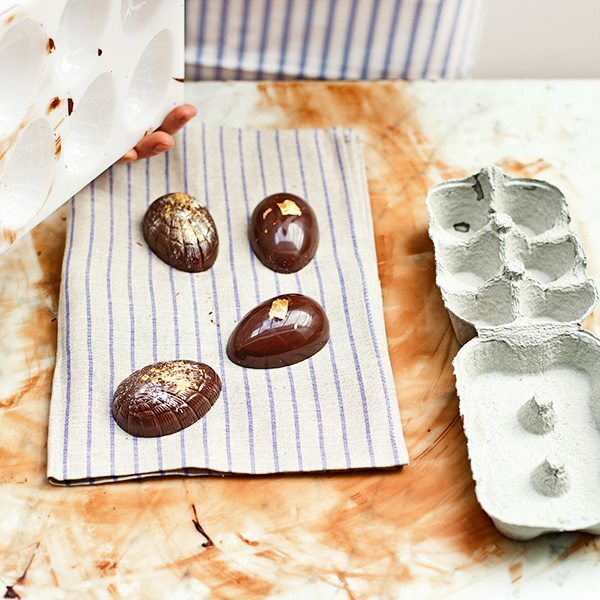 Follow Paul A Young’s easy step-by-step guide to discover how to make your own spiced salted caramel chocolate eggs at home. 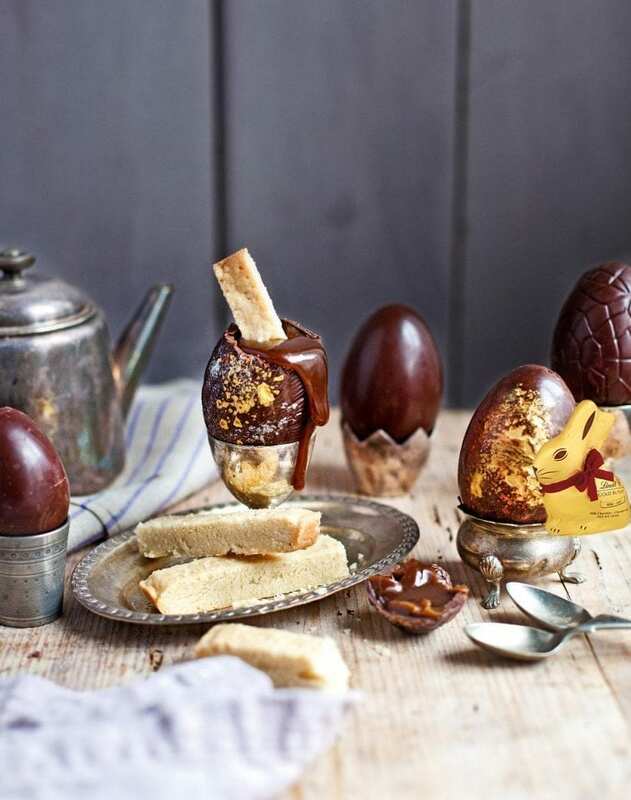 Get the full recipe for Paul’s simnel-spiced salted caramel Easter eggs here. Think about how you want to decorate your eggs, as some decorations need to start as part of the egg-making process. Always use a glass or metal bowl for melting and tempering Ceramic is slow to warm up and cool down, which means you’ll struggle to get the right final temperature for tempering. You need a lot of chocolate You can’t temper less than 500g and get good results. You’ll have about 250g left over from the eggs, but you can re-temper it up to four times. 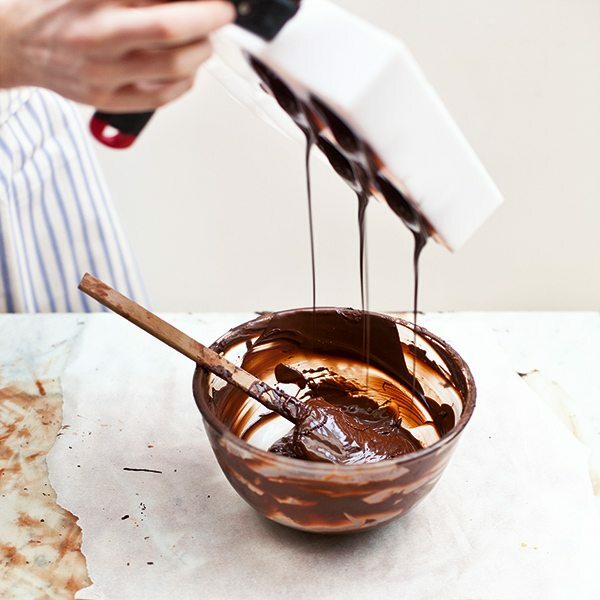 If your chocolate cools too much before you coat the moulds, put the bowl back over the hot water for 30 seconds to re-melt. Don’t add cooled lumps from the work surface – they’ll make all the chocolate solidify and you’ll have to start again. 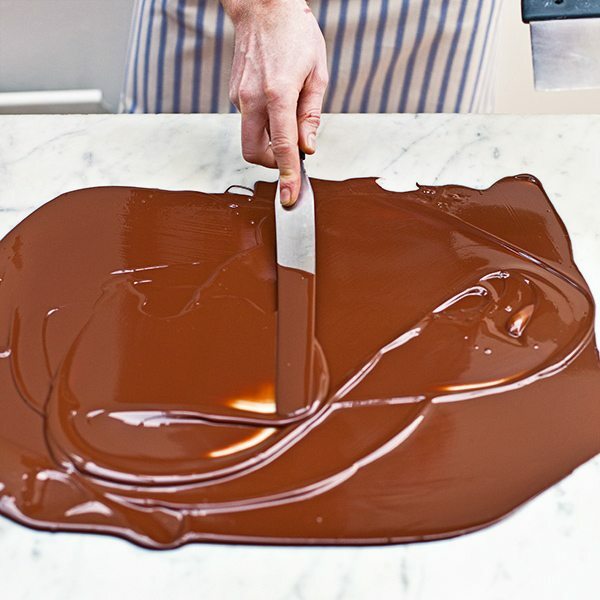 All shop-bought chocolate is tempered. To shape it you add heat to melt (un-temper) it. To mould it you melt it, then cool it as described in the recipe – it’s now re-tempered. When chocolate sets, the fats crystallise. If you let it set randomly the chocolate becomes dull and unstable. Tempering controls the way the fat crystals set, so you get shiny, smooth chocolate. Use edible shimmer powders or gold leaf (both widely available) to create pearlescent finishes. 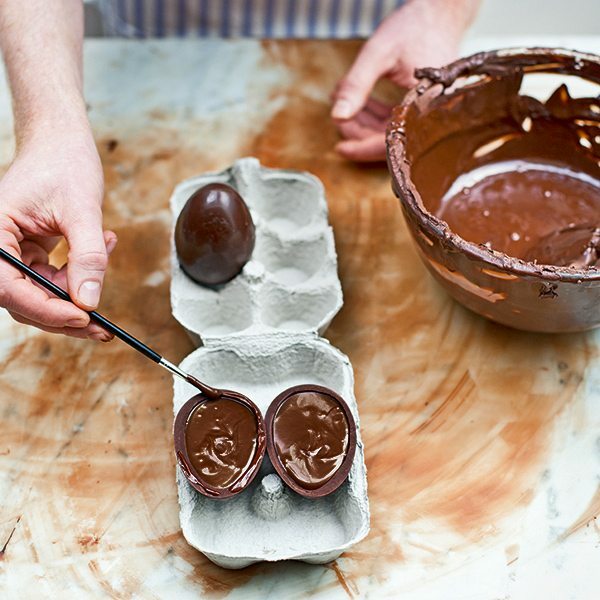 Put the shimmer into the mould before you pour in the chocolate so it fuses into the egg surface. Roll finished eggs in a little melted white chocolate, then use your fingers to create swirls. Roll finished eggs in more tempered dark chocolate, then in toasted chopped almond flakes. 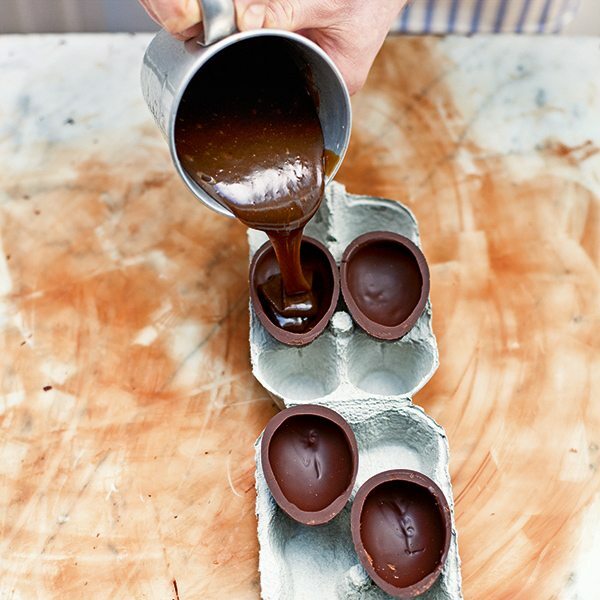 Fill a small nozzled piping bag with melted chocolate and pipe a decoration on to the egg. 1. To make the caramel filling, put the butter, sugars, salt and spices in a pan. Bring to a gentle simmer and bubble for 8 minutes, then remove from the heat and slowly pour in the cream, whisking (it may splutter). Add the milk chocolate and mix until fully melted. Add the brandy (if using), mixing well, then pour the filling into a heatproof container to cool. 2. Next you need to temper the chocolate – a critical technique for all chocolate work. 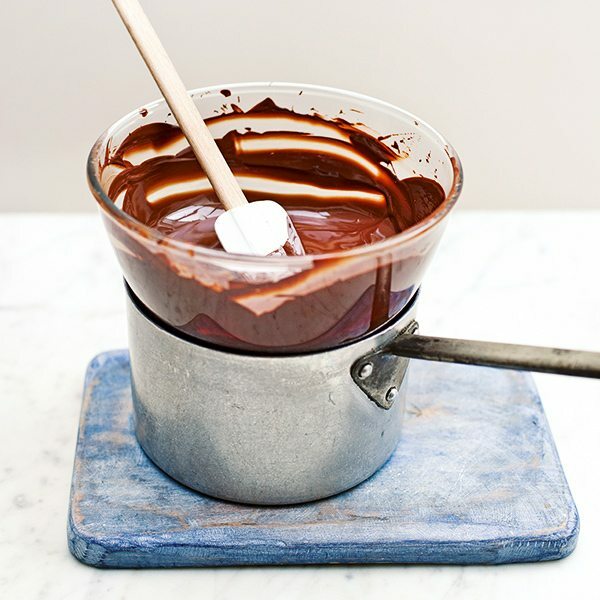 Put the dark chocolate into a 3 litre glass or stainless steel bowl and set over a pan of barely simmering water – do not allow the water to boil or touch the bowl as this will cause the chocolate to overheat and become grainy. Melt the chocolate for at least 1 hour, but 2 or 3 is better – this may seem like a long time, but it will ensure your eggs are crisp and have a satin shine. The chocolate should stay heated at 55°C – use a digital thermometer to check. 3. Take the chocolate off the heat, then wipe the base of the bowl dry. 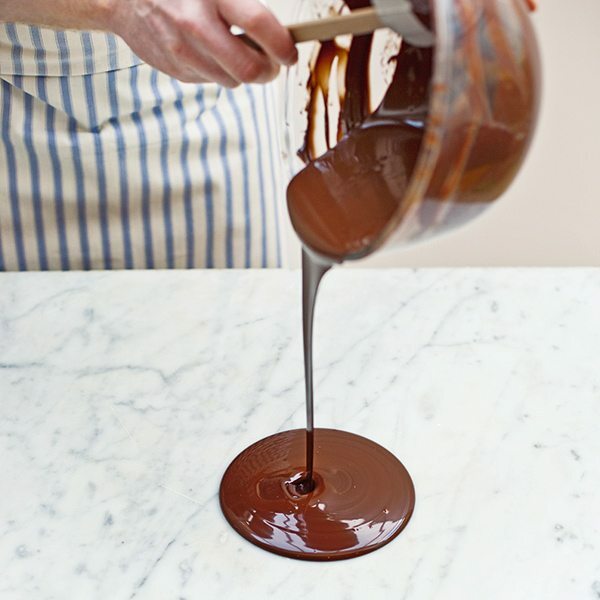 Pour the chocolate onto the marble slab or work surface, leaving a little in the bowl. Use a palette knife to spread the chocolate across the marble, then scrape back into the middle with a stainless steel chocolate scraper. This can be a bit tricky at first, but it won’t take long to master. 4. Repeat this process until the chocolate on the marble has cooled to 27°C – to check, stick a digital thermometer into the chocolate when you’ve scraped it back into the middle of the marble. The chocolate begins to crystallise and set at this temperature, so quickly scrape it back into the bowl with the remaining warm chocolate and mix very well. The temperature of the chocolate should now be at 31-32°C. 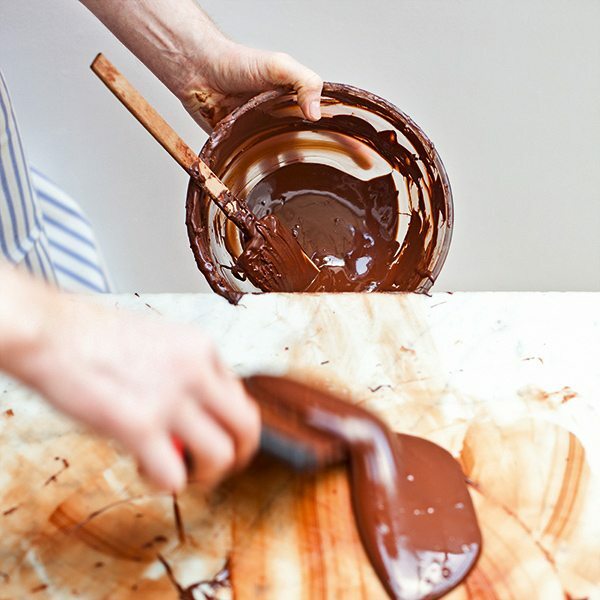 (Dip the end of the palette knife into the chocolate and let it set – the tempered chocolate should be smooth and shiny.) At this point you can coat, mould and create anything you like with the chocolate. 5. If using edible gold leaf or shimmer powder, place or sprinkle this into the egg moulds now. 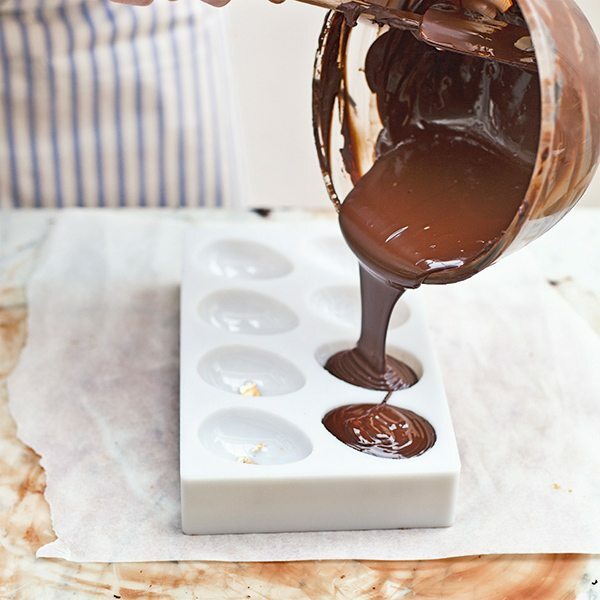 Pour the chocolate into the moulds, filling to the top. Tap to remove any air bubbles that may have formed, then leave for 3-5 minutes to allow the chocolate to begin to set around the edges – this will happen from the outside in. You are looking for a thickness of no more than 3mm. 6. Now tip the mould over the bowl so the excess chocolate can drip away. Scrape the top of the mould to give clean edges to your egg halves, then place upside down on a sheet of baking paper for 5-10 minutes. 7. Turn the mould right-side up, remove the paper, then scrape again to clean the edges of the egg halves. 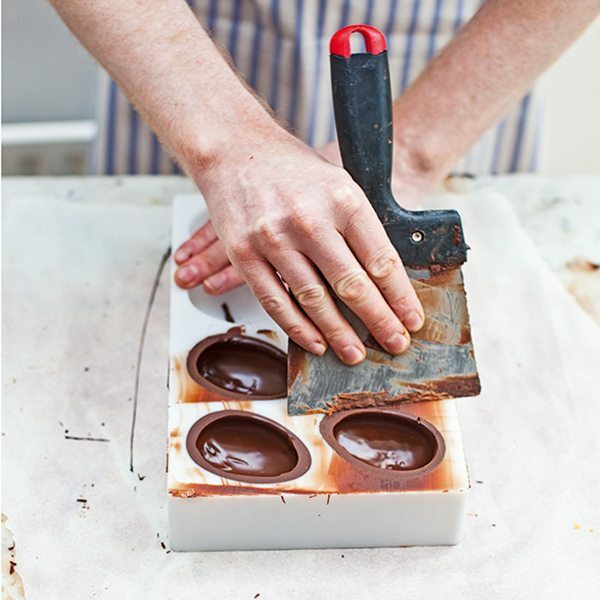 Transfer the mould to the fridge to chill for no more than 15 minutes – exceed this and moisture will appear on the surface and spoil the look and texture of the chocolate. 8. Lay a clean tea towel on the work surface, then carefully invert the mould so the egg halves drop out onto it. 9. 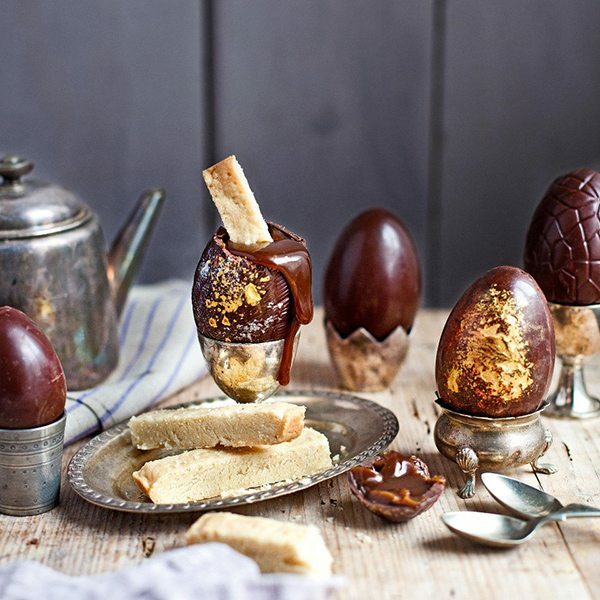 Now you can fill the eggs with the cooled spiced caramel. Put the egg halves, open-side up, in the egg box to hold them steady, then pour in the filling, leaving a 1mm gap at the top. Leave overnight in a cool, dry place to allow the caramel to set and crust over. 10. To stick the halves together, melt a small amount of leftover chocolate as in step 2 until just warm, not hot (no need to temper the chocolate – just melt it briefly). Use a small paint brush to apply a little of the chocolate around the rim of one egg half, then quickly place the other half on top and press to seal. Repeat with the remaining filled egg halves, then leave for 15 minutes to set. 11. Decorate however you fancy. Paul uses gold leaf and edible shimmer powder.